About one and an half years ago, Hans Andersson surprised us with his Tilted Twister simple and effective design for a Rubik's Cube solver based on the NXT platform. 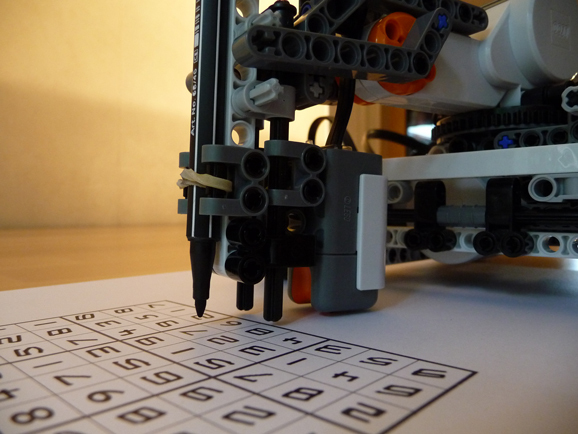 Now he did it again... this time the NXT solves Sudoku puzzles autonomously. From several steps (Scanning, Thresholding, Segmentation, Thinning, Feature extraction, Solving) to the application of some mathematical useful concepts, this robot starts scanning the puzzle at each individual cell for realizing the problem. Then step after step it fills (writes) the solution in the puzzle itself. Movements precision achieved with such simple mechanism (a four wheel car). Usage of the light sensor to extract (scan) all the required information from the puzzle in such reliable manner. The angular arm movements for scanning and writing functions, should have added some SW complexity, but the robot still looks to behave very reliable. You may find additional descriptions and details from the Hans' webpages dedicated to this robot, and shortly the building instructions plus respective SW should debut there as it happened before with the Tilted Twister. WOW! i'm lost for words! Agreed 100000000 stars for this, it's soooooo impressive! Very well done. holly... :X This is simply amazing. That's the kind of machine I would love to build, but would never imagine this detailed process! Congratulations Hans! Keep up the good work!